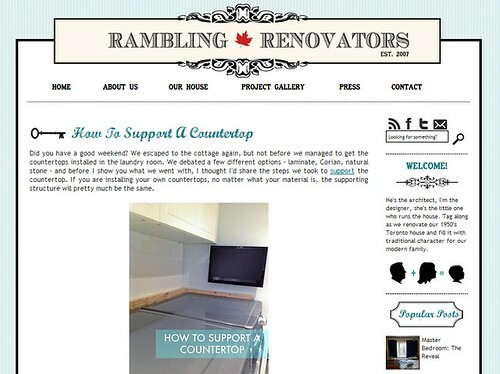 Jen's blog, Rambling Renovators, is a must read for me and has been for years now. Her home projects blow my mind, I don't know how she does it all! One of my favourite projects is actually one she just posted about, DIY Whitewashed Plank Walls. LOVE! I've had the pleasure of meeting her in person (thanks again Blog Podium) and she's so friendly and down-to-earth. Honourable mention here to her super sweet husband (also known as 'Handyman') who I chatted with a bit that day as well. And they have the cutest little girl. 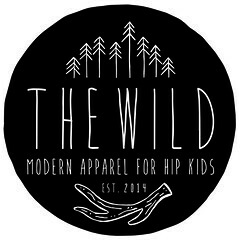 Such a cool family! If you've been reading her blog for a while now you may also be familiar with her brilliant series Blog Talk, where she shares her blogging wisdom with the rest of us. Jen, I can't thank you enough for passing along some of your insight! Jen kindly agreed to participate in Five Questions, and I couldn't wait to pick her brain. Here's what she had to say! 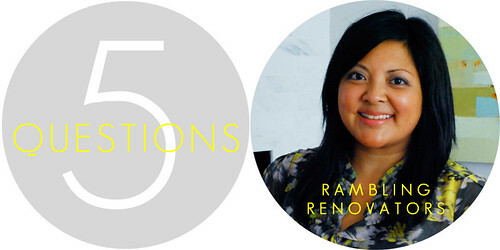 What do you like most about writing Rambling Renovators? I like the "give and take" of blogging. I love it when I'm able to inspire a reader with one of my projects to do something in their own home. But I love it just as much when one of my readers leaves me a comment which sparks an idea or pushes me in a direction I wouldn't consider on my own. It's that engagement, that back and forth and building a relationship with my readers which keep me blogging. I have a great supportive husband who makes it easy for me to take as much 'me time' as I need. He's great at taking over the child rearing duties if I need a break! We both believe its important to spend time with our own friends and have time to pursue our own interests, so I can always find time to do a sewing craft, read a book, or take an extra long bath if I want to. write my blog posts for the next day. My advice if you want to start a blog or a business or even if you want to pursue your dream...just do it, take a first step and do it. I find that even when I'm unsure how things will turn out, just getting started and putting things in motion helps bring things to reality. Inertia and over analyzing and worry are the biggest hindrances to success. Wasn't it Gretzky who said "You miss 100% of the shots you don't take"? I believe that, in life, blogging, the universe. Jen, thank you again for taking the time to answer these questions! And this is actually the very last of the Five Questions posts! There are some out there that could trickle in, but it's summer and people are busy so I thought I'd wrap it up here. Thank you again to everyone who participated, and to everyone who read each post and gave such great feedback! I really enjoyed doing this and I feel like I learned SO much from all of these amazing and inspiring women! Great answers from one of the greatest Canadian design bloggers EVER. period. end of story. Blog Talk is by far my favourite blog series out there; especially Jen's recent post on "balance" - felt like she was speaking just to me and just let everyone in on our private conversation. Loved this series Adriane. Thanks for letting me join in on the fun!